Looking for something fun and different to do with your friends, significant other, coworkers or social group? Bring your whole group together with an exciting, new experience. 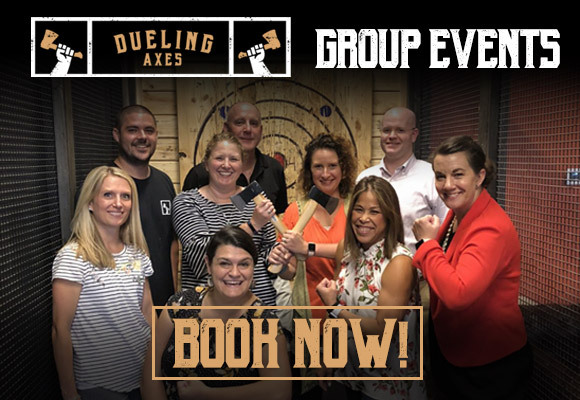 Axe throwing is the perfect night out, team building event, or group activity for your next outing! Our axe throwing lounge can accommodate up to 110 guests and there is plenty of space to cater in food and beverages. We think it’s the most exciting and social day or night out you’ll ever have and we’ve tried a few. You’ll be hurling axes down range with your friends and colleagues, hitting bullseyes, cheering each other on and competing for bragging rights. All backed up with a lounge atmosphere, great music and a chance to socialize between throws. There’s no better way to facilitate team building than learning a new skill. Cheer on your co-workers as everyone learns to STICK IT!